by: Boehringer Ingelheim Vetmedica, Inc. Contact your veterinarian before administering non-steroidal anti-inflammatory drugs (NSAIDs). It can happen to anyone – your horse is lame. 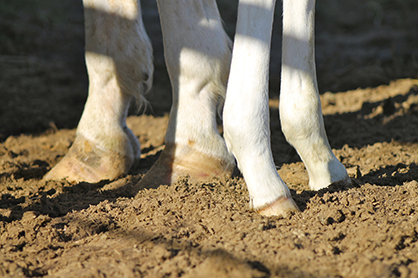 Lameness can be very subtle, or can be more obvious, but in each case, it’s important to determine when and if an NSAID is an appropriate treatment option, and if so, which NSAID to choose. After an examination, your veterinarian will determine the diagnosis. It might be OA, also known as degenerative joint disease (DJD), caused by progressive wear and tear of cartilage and other parts of the joint. Another pain management option veterinarians may consider is Surpass® (1% diclofenac sodium), a unique topical NSAID that provides pain relief directly at the site of inflammation. SURPASS is the only FDA-approved topical application for horses for the control of pain and inflammation associated with OA in the hock, knee, fetlock and pastern joints in horses. Conklin urges horse owners not to take joint health treatment into their own hands. Veterinarians will take into account the ailment, age of the horse, activity level of the horse and the route of administration. “Talk to your veterinarian about appropriate NSAID options for your horse,” he says. *Clinical relevance has not been determined.